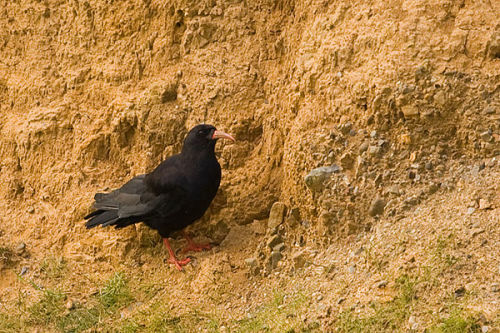 Chough - Pyrrhocorax pyrrhocorax - Breeding Resident , only black bird with red bill and legs , can be seen all along the pembrokeshire coast . It readily displays its mastery of flight with wonderful aerial displays of diving and swooping / Found in flocks in autumn and winter / Feeds on Insects and larval grubs , ants , lichen / While its black plumage identifies it as a crow, the chough ( pronounced 'chuff ' ) has a red bill and legs unlike any other member of the crow family / Nest of sticks and hair in rock crevices or sea caves . 1 Brood , 3-5 eggs , May - July , Incubation 17 days , Fledge 36 days .